Kenny Jackett is delighted to see Pompey’s Ronan Curtis being recognised on the international stage. 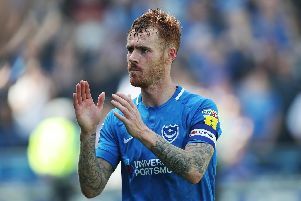 The Irishman has been a revelation since arriving at Fratton Park from Derry City in the summer. The 22-year-old has netted six times and notched seven assists in his 17 club appearances to date. And that impressive form has not gone unnoticed by Republic of Ireland manager Martin O’Neill. He handed the wide man his senior international debut in Thursday night’s friendly against Northern Ireland in Dublin. Curtis came off the bench at half-time and played the entire second half in the goalless draw – making an impressive impact on the Aviva Stadium crowd. Pompey manager Jackett is thrilled to have one of his squad turning out for their national side. He said the club’s delighted to see Curtis’ fine form being recognition on the international stage. ‘As a club we'll support him 100 per cent. It's terrific to have players with us pushing for international starts,' said Jackett. ‘I'm pleased for him and pleased for the club as well that he's getting selected. 'He must be high up in the manager's thoughts. 'It's good for him and good for his family. 'He'll be proud, he'll be wanting to play for Ireland and so he should. 'As a club we back him and are pleased to have current internationals within our group. 'I haven't spoken to either Martin or Roy Keane (Republic of Ireland assistant manager). 'I don't know what their thinking is. Curtis’ move to Fratton Park came after four years at League of Ireland Derry City. The Irish talent has never appeared fazed by the expectations of donning the star & crescent, with the London-born ace being one of the Blues’ stand-out performers this season. And Jackett is not surprised by the immediate impact the Ireland under-21 international has had. The manager added: ‘Ronan has been good for us from day one in pre-season and did well for us in the pre-season games. 'It didn't take him long to settle, he hit the ground running here. 'That was probably because the Irish season was up and running and he had two-and-a-half-weeks off, something like that.